Five billion people are set to live in cities by 2030, double the current urban population, with Africa and Asia leading this urbanisation wave. These cities can be engines of economic growth for entire regions and the focal point for several pillars of daily life, including communication services, educational and health services and scientific innovation. he expansion of our cities brings transformational opportunities to people, families and communities in the form of job creation, access to resources and improved well-being. But it also exposes, and sometimes exacerbates, existing inequality, poverty, and other social challenges. Against the backdrop of contrasting experiences for city residents, city leaders — including those within the public, private, and non-profit sector — might want to include measures of happiness to establish priorities for development and investment. Given the gravity of our urban challenges — poverty, hunger, disease and inequality — happiness may seem a lofty and ideological aspiration. But economists and psychologists have developed a consistent way for individuals to self-report their own happiness, which provides important and detailed information that can be used to better inform ways of improving the quality of life in cities. A similar argument has been emerging over the last 15 years on a more global scale. At the start of the century, the Millennium Development Goals helped guide national priorities towards eradicating the world’s most pressing social problems. Largely focused on uplifting populations in developing countries, these goals were replaced in 2015 by the even more ambitious Sustainable Development Goals (SDGs), a “call for action by all countries, poor, rich and middle-income to promote prosperity while protecting the planet”. This shift in thinking is important. These goals have been developed by the United Nations Sustainable Development Solutions Network (UNSDN), the same group responsible for the annual World Happiness Report. The report ranks countries by their average national “happiness” scores, derived from the responses to a survey in which respondents are asked to evaluate their satisfaction with their lives. In fact, during the lead-up to the launch of the SDGs, the UNSDN made persistent efforts to world leaders to include happiness measures, also known as subjective well-being, for adoption within the SDGs. Even though the measures were not included, the message was heard: happiness measures are a critical indicator of whether the path governments take support the public’s ultimate interests. There is a growing interest by governments to include measures of happiness and well-being in their national statistics. As the volume of research on happiness increases, emphasis is being placed on how to measure it and what relationship it has to national wealth and social policy. The UK, Indonesia, Australia, Mexico, and Austria are a few examples. Closer to home, the UAE has a Minister of Happiness and has set its own national happiness objectives. Bhutan has been a pioneer in its approach to measuring happiness and well-being and using those measures to make decisions. Rejecting the concept that gross domestic product (GDP) was the driving force of happiness, Bhutan has since 1971 been championing an approach to development which measures prosperity through formal principles of Gross National Happiness (GNH) and the spiritual, physical, social and environmental health of its citizens and natural environment. Economic aspects are integrated into the multi-dimensional index. The rising visibility of happiness measures, and their related quality of life measures, is influencing cities and local governments as well. The Wellbeing Project in Santa Monica, California, was initiated in 2013 to “go beyond economic indicators” through their bespoke well-being index to capture residents’ satisfaction with their city and identify ways to improve. 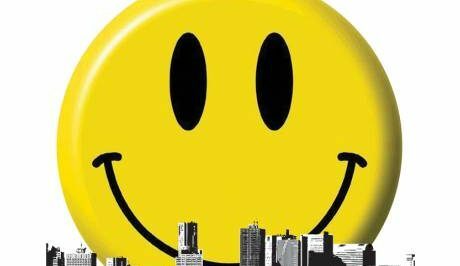 Despite this growing interest and examples of countries, cities, and even private enterprises measuring happiness, there are fewer examples of how to use this data on happiness to inform fundamental building blocks of city-making — policy, infrastructure development, and municipal services. But this, too, is beginning to change. In Dubai, smart city management is being used to measure happiness by providing reliable and responsive municipal services which can be calibrated to meet individual needs. As residents, we have now come to expect a digital smiley, straight or sad face, prompting us to rate services, and these, along with real-time usage trends, are provided to authorities. These measures have influenced municipal service providers as diverse as Dubai Customs and Dubai Electric Water Authority to find ways to make their services better for residents and visitors alike. The way a city is planned, funded, and managed can have an impact on its happiness and wellness when these steps are aligned with these measures. Deliberate urban planning, which considers the needs of a socio-economically and demographically diverse population, supports happiness by facilitating smoother commutes, encouraging active lifestyles, and facilitating work-life-leisure balance. Parks, shopping, home, and even workplaces, are in proximity to minimise time spent commuting and enable greater time with family and friends. Or, the happiness measures from a community may suggest other areas to prioritise for development, rather than a one-size-fits-all approach. Building healthier, happier places is not more expensive. In the long-term, it saves money. Improving happiness in different domains can positively benefit not only individual happiness, but the economy, the environment, and social development in a virtuous cycle, making it economically beneficial. Cities that encourage social interaction foster greater levels of creativity and trust and ultimately contribute to economic growth. Rather than solely relying on metrics deemed to be in the best interest of the public, including happiness and well-being as measures will help guide city leaders, private enterprise, and civil society organisations towards development that is meaningful to communities and contributes to improved happiness worldwide. — Imran Markar is Principal at United World Infrastructure, while Aubrilyn Reeder is Senior Manager.